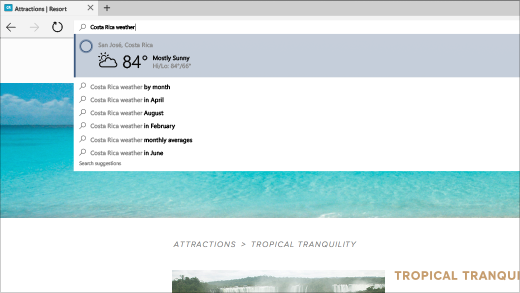 Think of the Hub as the place where Microsoft Edge keeps the things you collect on the web. My select Hub to view your favorites, reading list, browsing history, and current downloads. To import your favorites from another browser, select Hub > Favorites > Import favorites. Press and hold (or right-click) any item in the list and select Sort by name to arrange them alphabetically. Sign in with a Microsoft account to make your favorites and reading list available across all your Windows 10 devices. Whether you’re looking for pictures of penguins or just want to know what the weather is, save time by typing your search directly in the address bar. You’ll get search suggestions, instant results from the web, and your browsing history, on the spot. original comments may not have gone through. so just must shorten, i feel like I may be heard here. I like Edge, at least when working correctly. I wish updates with MSN/WIN10/Edge w/Cortana were more compatibly friendly with non-MSN browsers, among other programs, sites, search engines and browsers. Article states how easy to get info such as favorites or bkmarks from other browsers but it seems with each passing update, even back before free upgrade end date, updates were causing as many or more issues than were fixed-in ALL versions of windows back to vista. I would like to see more user friendly with other companies, giving users more choices. Done much research due to so many issues, repairs, down to one machine and esp last few days been going crazy and w/out sleep due to updates? or something sneaking in elsewhere both to Google Chrome, which has hask: crbug.com129406, Chrome browser unusalble temporarily, hoping; also wajam malicious software on program files app data but is wrong path so not sure where it is hiding; unless win10 defender took care of. So, if program friendly, one browser may be down but with proper compatibility and sync settings whichever goes, until fixed, the other is useable, preventing a download of another browser and the research to find one. I am an at home mom (low, poverty level income due to disability), and many more individuals and families in same situation. we depend on our machines (mine-w/desktop pc, web capable all in 1 printer, ibook portable harddrive for backups, system worked great!a0laptop pc added, pc down, back up running great again, want to upgrade to win10 like laptop,which is only decent running machine right now, w/a browser down, praying Edge holds and Defender is proof of excellent security program. If MSN/win10 keeps pushing the way it is; users will end up with no real choices= either take it or see ya, what do we try next. Many can’t afford this option. I think MSN/win10/ edge, et al. are finally getting things working as they should. problems happen, but shouldn’t become full-time job for the users; MSN, we are your clients, businesses are only a percentage of what keeps you afloat; the little home users may even be a bigger percentage if all figured out, though this is just my point of view. 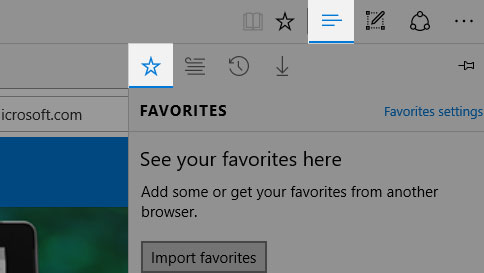 I do love how it works when it works right and the upcoming ideas, again, if all works, and loosen up with giving users some choices; I never planned on leaving windows; and many of us our there probably feel the same. I mean my comments only as constructive criticism and advice from one of your users point of view, and even compliments – the more that works properly the more positive feedback you’ll get. Especially if given choices instead of being pushed into a corner with nowhere to go. Thanks for listening! have a great day! the full comments were posted just a few minutes ago re: MS Edge, what is it? Spoke of browsers, changes, wht liked what should change or improve. sent w/out the infor about which website, so that’s what this is for. I agree 100 percent with 101jeanniec…..athough this is the year 2017……and it fixes the year 2016…..I’ll pass on the year issues…..and carry on to what I have to say……and that is….I’m also a desktop user…..and it seems MS gives me the mobile option…..good option mind you…..but I’m not in the younger crowd generation……I’m an old schooler…..yes mid 70’s…..so what is an old guy like me supposed to do….. retaught to do things correctly in this new cyberspace generation…..I’m just gonna’ sign off and see what my true options are for real time as they tell me….Thank You Kindly……101 jeanniec….P/S I’m so glad to hear I’m not alone out here…..signed Allan. I feel like when a program or app is working fine, suddenly something new is added and it messes everything up, has glitches, and all kinds of new problems. I was fine with previous versions such as Windows 7. OK with W 10 but why adding Edge and all sorts of other things that the average consumer doesn’t need? I end up on the phone or with some agent for hours for some of the new problems. I have had great, free included programs in the past that are now “obsolete” and no longer compatible or available. you know the saying, ” if it ain’t broke, don’t fix it”? Well, they keep fixing it and ruining it. Next Next post: Google Chrome ran out of memory while trying to display this web page.